Computing facilities and support are provided by the Statistics Department, the College of Science (Science IT), and the central university computing group, known as Information Technology at Purdue (ITaP). ITaP centrally supports many computing resources, including instructional labs, classroom technologies, core network infrastructure, research computing, etc. 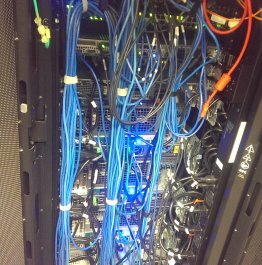 It also supports several supercomputers, including the fastest supercomputer on any academic campus in the world at the time it was built in June 2013 (see Top500.org). The Department, the Science IT group, and ITaP work closely together to provide a robust computing environment that facilitates world-class instruction and research. The department operates a Microsoft Hyper-V virtualization infrastructure composed of six virtualization servers, each with 256GB RAM, 16 CPU cores, and a 10GigE redundant, cross-linked back end network to a 92TB Dell Equallogic Storage Area Network (SAN) that auto-tiers banks of SSD, 15K RPM, 10K RPM, and 7200RPM drives. The department maintains a Windows 2012 Active Directory domain comprised of virtualized servers and some physical servers for redundancy. It includes several domain controllers, redundant print servers, redundant fileservers served via the 92TB SAN, and a number of administrative servers performing tasks like deployment of Microsoft patches, anti-virus administration, desktop deployment, etc. All virtualized servers have 10GigE network connections and physical servers have gigabit network connections. They are rack-mounted in a managed datacenter with redundant power feeds from two power companies with auto-failover, whole-room uninterruptible power supplies, and secured with card-swipe access doors and security cameras. Windows 7 desktop computers are distributed among faculty, staff, and student offices and in graduate student computer labs. The four graduate student computer labs are populated with 3.4 Ghz Core i7 desktops with 16G of RAM and 24-inch monitors. Faculty and staff offices are typically equipped with a 3.4 Ghz Core i7 desktop with 16G of RAM and a pair of large monitors. Each desktop PC is configured per the National Security Agency's Windows Security Recommendation Guides, which restrict the ability of users to modify most files and registry settings on the local computer. This greatly enhances security and significantly reduces the chance that a lab user could modify, corrupt, or destroy the OS or application software on a lab computer, and reduces the possibility of acquiring malware. When a user logs into one of these desktops they access the files in their home directory from a central fileserver, meaning the desktop files, configuration settings, etc. will be identical regardless of which PC they use. New Windows 7 desktops are deployed using Windows Deployment Services / Microsoft Deployment Toolkit. Major software packages on each desktop include Microsoft Office 2013 Professional with MathType, SAS, R and Rstudio, Matlab, Maple, WinBugs, Xming, SSH, Acrobat, TeX Live with Texmaker, Emacs, Notepad++, Ghostscript, and Skype. Some desktops will also have additional software as needed. The Windows 2012 fileservers are backed up nightly to two locations, one of which is in turn backed up to a third location. Since the desktops utilize central fileservers for user data, and only use the local hard drive for the OS and applications, there is nothing on the desktops to back up. Any desktop could fail at any time and the end user wouldn't lose any files since they are all stored on central fileservers. The department has configured and distributed laptops to faculty, staff, and graduate students as appropriate for teaching. Laptops have all the same software as is available on the lab and office desktop computers. 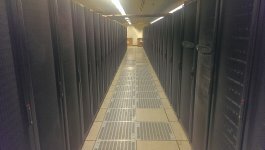 The department maintains around forty physical or virtualized UNIX/Linux/BSD servers providing a variety of services including general multi-user computing, specialized research computing, file service, and general infrastructure. The twenty-nine dedicated departmental research servers range in power, but all have between eight and 24 CPU cores, and includes servers with 384GB RAM with 48TB disk, 256GB RAM and 30TB disk, five servers having 128GB of RAM, six having 64GB RAM with 24TB disk each, eleven having 32GB RAM, and five having 16GB RAM. The six 64GB servers are part of a Hadoop cluster utilizing 144TB of internal disk space. One of the 128GB servers uses a 24TB Lustre filesystem, with the other servers generally having 1TB to 2TB disk space each. Many Linux servers use the departmental 92TB 10GigE based iSCSI SAN for storage. There are a number of administrative servers providing services like DHCP, CIFS, firewalls, configuration management, MySQL, Web, Wiki, printing, backups, etc. Servers are running Red Hat Enterprise Linux Server 6 or 5. Major application software available includes R, SAS, Matlab, Maple, Mathematica, and LaTeX. There are a host of freeware compilers, applications, and utilities available as well. UNIX servers are also housed in the same managed datacenter described above. Remote low-level console access is available via iDrac or iLO over a private, secure management network. Backups happen nightly for all UNIX/Linux servers. Backups are pulled over the network via Dirvish to the departmental 92TB SAN. For redundancy, they are then pushed to an ITaP-managed 3 petabyte Isilon storage array. Additionally, end-of-semester tape backups are created each spring, fall, and summer. Files stored on the Linux servers can be visible as shared network drives from both the departmental Windows desktops, from the ITaP Windows desktops, or from off-campus desktops or laptops via a VPN connection. The department maintains thirty black and white laser printers and three color laser printers. The printers can be found in computer labs, staff offices, and in the offices of faculty members who have purchased them with startup funds or through grants. Administrative databases pertaining to personnel, textbooks, course scheduling, alumni, etc. are maintained using Microsoft Access on Windows 7 desktop PCs. Non-sensitive data from these databases is automatically exported nightly to a MySQL database, permitting the PHP-based departmental web pages to be dynamically populated with the most up to date personnel and academic information. An internal departmental web server makes non-public information available to our faculty, staff, and students. Doug Crabill, the Senior Academic IT Specialist, builds and maintains specialized Linux research servers to support large data and intense computational needs, works with faculty and graduate students on research projects, providing direct algorithm advice and coding support, acts as a liaison to ITaP and assisting faculty with the use of the large ITaP research clusters, and acts as a liaison with the Science IT group.